Don't miss out on getting your copy of this amazing professional photo fundraising calendar. Standard 8.5" x 11" size pages. BHNW outdoor window decals are also available at our event booths for $5 each. If you cannot make it to one of the events they are available for purchase here online. An additional $1 will be added for S & H.
Your purchase supports dogs in our program and is a great way to show your support for our cause. In stock availability is limited, but we will order more as needed. Decal is 5 inches in diameter. BHNW automobile window sun shades are available now! This new sun shade includes the BHNW logo and the words "For the love of DOG, don't leave 'em in the car. 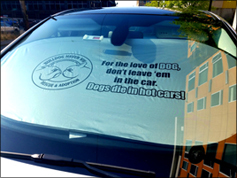 Dogs die in hot cars!" $25 per shade includes the cost to ship. Help keep your car cool and remind others not to leave their pets in the car at the same time.